Hello again, plant experts. I think this is some kind of tropical (or subtropical) taro plant. Am I correct? Thanks in advance. Caladium. Same Arum family as Taro (Colocasia) but these have very decorative leaves. Any specific type of Caladium? Update: Looks like this cultivar maybe? Lots of different ones, John and they are often unnamed varieties or grown from mixed seed. I've only ever grown a couple of varieties and that was years ago. Too tender for our damp Plymouth summers outside and they didn't thrive in my small greenhouse. 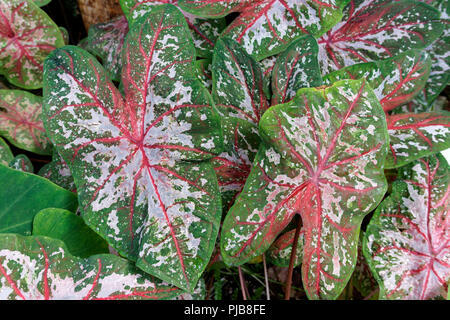 It looks a little like a slightly refined form of the species Caladium bicolor so I'd be tempted to just label them as green, white and red leaved Caladium hybrids. Thanks again. I'll do that.